RSM Tenon, one of the UK’s most progressive and exciting accountancy firms in the country invited former Manchester United and England footballer Lee Sharpe and legendry golfer Gary Wolstenholme MBE to join them for their extremely popular and challenging annual golf day at Rushcliffe Golf Club in East Leake. The RSM Tenon annual golf day is held to thank the company and its partners in business for their ongoing hard work and progression. As well as thanking the many staff at the company, the event helps to raise money for Loughboroughbased Charity Rainbows Hospice for Children and Young People. The longest putt competition together with the auction of a luxurious bottle of champagne raised an impressive and much-needed £600 for the ever-deserving Rainbows. The Hospice is the only hospice for children and young people in the East Midlands and care for over 250 local children and their families. With the winning team receiving signed memorabilia from Gary Wolstenholme MBE everyone was intent on securing the fantastic first prize. 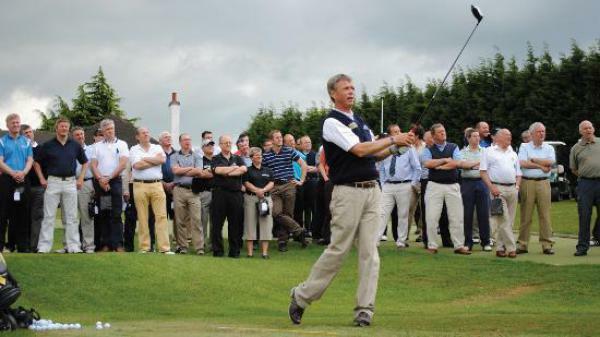 As well as the main team competition there was the opportunity for golfers to test their golfing prowess against that of professional golfer and winner of the 2006 British Par 3 Championship Shaun Webster. Competitors had to land the ball directly on the green from the tee on the 5th hole. Five players impressively succeeded, including RSM Tenon’s Angela Smith and local youngster Ben Hall. There was the opportunity to mark the longest putt at the putting green on the first hole and footballer Sharpe, who also played for Leeds United, came incredibly close before being denied the honour by guest Steve Rawlinson holing from an incredible 56 foot putt. Guest Rob Parkin won the longest drive registering well over 150 yards. Team 15 headed by RSM Tenon’s Richard Coombs won the overall competition registering a staggering 92 points on the board. All the winners of the day’s various competitions were awarded their prizes in the evening at the golf club enjoying fine food and great entertainment. Gary Wolstenholme hosted the evening and told interesting tales of his defeating a then young Tiger Woods in an England versus USA Walker Cup match back in 1995. Lee Sharpe followed with highly amusing stories of his time at Manchester United and his recollections of players past and present.